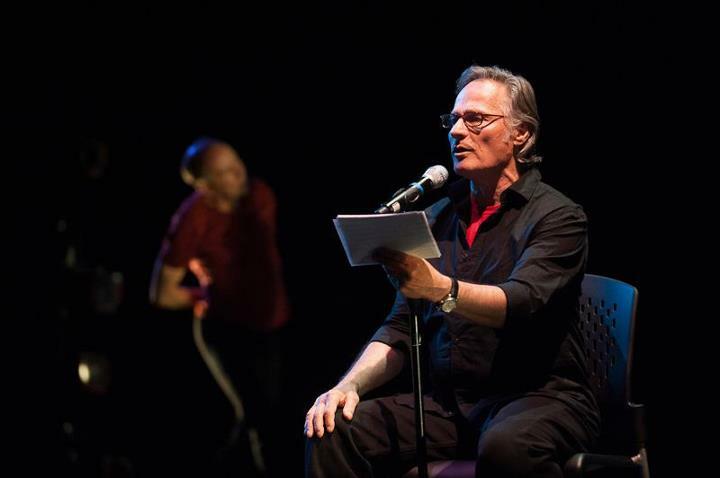 This summer Jacob’s Pillow Dance Festival, for their 80th Anniversary season, presented “The Men Dancers: From the Horse’s Mouth,” an homage to the Pillow’s pioneering founder Ted Shawn and his company of Men Dancers. The program featured dance artists such as Dance Theatre of Harlem founder Arthur Mitchell; tap dancer Jason Samuels Smith; Trent Kowalik, who played one of the original “Billy’s” in the musical Billy Elliot; choreographer, performer, and dance writer Gus Solomons Jr.; choreographer Cartier Williams; Robert Swinston, Director of Choreography for Merce Cunningham Dance Company; Festival 2012 artist John Heginbotham; and of course our very own Lar Lubovitch. Through this event the cast was able to share stories and give insight into their personal world of dance. Lar Lubovitch, with his first choreographic work projected on a screen behind him – his audition piece for The Juilliard School – read the story below. A little less than a century ago, in pursuit of the freedom to dream, my grandparents left Russia, settled for a few years in Paris, eventually crossed the big waters to Montreal—and then between the two great wars, finally stopped running when they reached the vibrant immigrant ghetto of Chicago known as Maxwell Street. It was there that I began my life, and there at the age of 5 that I discovered the dancer in me. We lived on the second floor of a building whose windows looked directly into the second floor windows of a Woolworth’s Five and Ten Cent store across the street, which everyone called the Five and Dime. Its red lacquered store front sign with big gold letters, its polished brass doors opening onto counters displaying trinkets, toys, ribbons, lipstick, rouge, sundry and gewgaw of every description. To my child eyes it was a carnival of the imagination. One winter night in the midst of a bitterly cold Chicago snowstorm, a raging fire bellowed through the windows of my Five and Dime. All through the night, red fire engines wailed from the street, throwing gushers of water onto the roof. By the next morning, illuminated by a blue-blue sky and a brilliant winter’s sun, the gushers of water had expelled back through the second story windows and frozen solid into giant cascades of clear, smooth ice, and suspended within their cores, all the teddy bears, dolls, jewelry, shiny trinkets and doodads now held captive within the gleaming frozen waterfalls. The sight of this astonishing image sent my mind and body into a wild dance in which I cast myself as a teddy bear caught in the cataclysm. Choked by smoke then tinged by fire then cooled by water and lifted and hurled and sent spinning through the deluge until finally, inexorably, slowed to a stop within a frozen tomb of ice through which I could see with my wide open black button teddy bear eyes the faces of children in the street held back by firemen in black slick coats and red hats from saving me from my cold fate. After that, and for many years hence, I improvised dances in response to my life—usually alone in the living room with the furniture pushed back, and occasionally with willing friends. It wasn’t until I was in college at the University of Iowa that I discovered a world of people who danced and made up dances existed far, far away in a magical kingdom called New York. I was advised to go there and seek out The Juilliard School and found myself one day at the enrollment desk filling out an application to audition. To my chagrin, I was told that I had to do a dance the next day for a panel of teachers whose glamorous names I’d never heard before—amongst them, José Limón, Antony Tudor, Martha Graham, and Anna Sokolow. The girl who auditioned before me did a tap dance on toe shoes while playing the marimba. I was very impressed. But she was lacerated, chewed up and spit out by Anna Sokolow—a now nearly forgotten, but truly great mid-century choreographer renowned by her students for her cruelty. For my turn, I danced a short piece that I’d made overnight in a narrow rectangular room with the bed stood up against the wall at the Manhattan YMCA. They must’ve liked it because from that moment on I was given the privilege of a life in dance. Next year will be my 50th year as a dancer, the 45th anniversary of my company and my 70th birthday. But to this day, the sight of a great dancer dancing still gives me the same thrill as the frozen waterfalls of the Five and Dime fire. Lar Lubovitch awarded the 20th annual prize for best choreography by the Prix Benois de la Danse at the Bolshoi Theater. New York, NY, May 23, 2012 – Last night at the Bolshoi Theater in Moscow, Lar Lubovitch was awarded the 20th annual prize for best choreography by the Prix Benois de la Danse. Lubovitch is the first American choreographer ever presented with the award. He was honored for his creation of Crisis Variations, which premiered at the Baryshnikov Arts Center in New York City on November 9, 2011. The work, for seven dancers, is set to a commissioned score by composer Yevgeniy Sharlat, and the score was performed live at its premiere by the ensemble Le Train Bleu, under the direction of conductor Ransom Wilson. To celebrate the occasion, the Lar Lubovitch Dance Company performed the duet from Meadow for the audience of 2,500 at the Bolshoi. The dancers in the duet were Katarzyna Skarpetowska and Brian McGinnis. Lar Lubovitch is the first American ever to be so honored. For the best performance by a ballerina: Alina Cojocaru for the role of Julie in “Liliom” at the Hamburg Ballet. For the best composition, Michel Legrand for the music for “Liliom” at the Hamburg Ballet. A special lifetime achievement in choreography was given to Pierre Lacotte, a French choreographer who celebrated his 80th birthday last month. He did most of his work for the Paris Opera but also choreographed productions at most of the famous ballet and opera houses of the world, including the Bolshoi Theatre in Moscow and the Marinsky in St. Petersburg. The jury that awarded the prizes was co-chaired by Yuri Grigorovich (choreographer of the Bolshoi Theater) and John Neumeier (director of the Hamburg Ballet). The other members of the jury were Altynai Asylmuratova (artistic director of the Vaganova Ballet Academy in St. Petersburg), Laurent Hilaire (ballet master and deputy director of the Paris Opera Ballet), Kim Joo-won (prima ballerina of the Korea National Ballet of Seoul), Manuel Legris (artistic director of the Vienna State Ballet); Alessandra Ferri (director of the ballet program of Festival dei 2 Mondi in Spoleto), and Jorma Elo (resident choreographer of the Boston Ballet). All of the jurors were themselves previous winners of the Benois de la Danse. 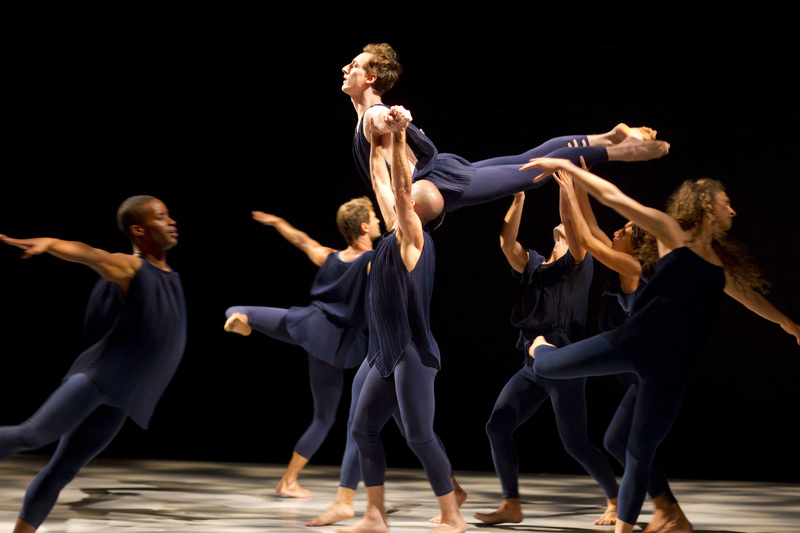 The Lar Lubovitch Dance Company will perform Crisis Variations on tour this fall in Philadelphia (Annenberg Center on October 11-13), Boston (Shubert Theater on October 19-20), and Washington DC (Kennedy Center on November 29-30), among other cities, and will present an encore of the dance as part of its next home season in New York City this coming November (at a theater to be announced). The creation of Crisis Variations was supported, in part, by public funds from the National Endowment for the Arts, the New York State Council on the Arts, and the New York City Department of Cultural Affairs in partnership with the City Council. The company also acknowledges the generous support of the Open Society Foundation’s Performing Arts Recovery Initiative (administered by the Fund for the City of New York), O’Donnell-Green Music and Dance Foundation, McMullan Family Fund, Shubert Foundation, Jerome Robbins Foundation, A. Woodner Fund, and Harkness Foundation for Dance. For more information on Lar Lubovitch – and a list of all the nominees for this year’s Prix Benois de la Danse – visit http://www.lubovitch.org. Katarzyna Skarpetowska and Brian McGinnis performed the duet from Meadow for the audience of 2,500 at the Bolshoi. Would you like to see an exclusive FREE performance by the Lubovitch Dance Company this July? Today we are announcing, in celebration of National Dance Week, the start of our first ever contest on Twitter where we will be giving away 2 FREE tickets to a lucky winner! All you have to do is follow us on Twitter and retweet us with the hashtag #lubovitchcontest to be put in the running for 2 FREE tickets to a private showing of the Lar Lubovitch Dance Company on July 12th, followed by a private reception. The contest ends Thursday and the winner will be announced Friday, June 24th! So hurry and get tweeting while you can, and if you’re not on Twitter there is still time to sign up and start following us! See our Twitter page for more details and good luck! We are excited to bring to you the first installment of our Lar Talks series. In this video Lar explains the creative process that went into choreographing “The Legend of Ten”, a piece that premiered at the Baryshnikov Arts Center back in November 2010. This video was shot at Skidmore College, where Lar and the company were leading a 3-week intensive workshop. National Dance Week in NYC! As we wrap up our summer residency at Skidmore College, we return home to the Big Apple just in time for National Dance Week! This year’s celebration is from June 17-26 in all five boroughs of New York. NDW is kicking off with a flash mob performance in Union Square at 5:30pm on Friday, June 17th (there’s still time to participate and learn the routine on YouTube!). If you check out the National Dance Week’s website there are all sorts of events, discounts, and free dance classes happening all around the city. In celebration of National Dance Week we decided to do something special for our loyal fans. We are giving away 2 FREE tickets to a private studio showing of the Lubovitch Dance Company on July 12th, 2011. We’ll be hosting a contest on Twitter next week, so make sure to follow us on Twitter (if you’re not already following us) so you can get more instructions on how to participate and how to be the lucky person who wins the tickets! A part of our lecture/demonstration series at Skidmore College. This is a studio showing so there is no theatrical lighting or costumes! From May 29 – June 18, 2011, Skidmore College will offer an intensive workshop for pre-professional and professional dancers in Saratoga Springs, New York. Led by Lar Lubovitch and his ten-member company,the program will offer training in Modern Technique, Lubovitch Repertory, Body Conditioning, Ballet, Jazz, and Special Interest Seminars. Veteran Lubovitch dancers, Rebecca Rigert, Nancy Colahan, Sylvain Lafortune and Jeanne Solan will join the company in teaching daily classes. Students will have the opportunity to enjoy Skidmore’s facilities and Saratoga Springs while training and performing under the guidance of world-class dancers. There are still a couple of days left to sign up. Aside from the workshop, Lubovitch will be offering Master classes, lectures and demos on several nights that are open to the public. For more information please visit the Skidmore website. Welcome to the official blog of the Lar Lubovitch Dance Company. Here we will be posting exciting news about upcoming events, performances and demonstrations. We will also keep you up to date by posting photos, videos and reviews of what is going on here at Lubovitch. We are in the process of gathering content so check back here often and don’t forget to follow us on Twitter and Like us on Facebook!